At ECU Technologies we know that good ECU testing is critical in helping you to make an informed decision as to whether an ECU needs repairing or replacing. Our ECU testing facility is highly advanced and gives us an extended range of parameters to enable accurate fault finding. Our test rigs have been designed and developed to run your ECU in real time, in exactly the same way as it does on your vehicle. We are able to simulate any operating parameters to recreate the conditions in which your unit is failing. We use exactly the same load actuators to ensure the drivers inside your unit are stressed to the same level they are on the car. We successfully identify intermittent faults with extended ECU testing, if necessary under harsh environmental conditions. It is important to test your unit as accurately as possible; we have the equipment and know how to do exactly that. The more information you can provide us as to the fault description on your vehicle the better the service we are able to give. Our technicians have a great deal of experience in testing and repairing Engine Control Units. They have invaluable knowledge about what goes wrong with ECUs and how to put it right. Our ECU testing facility covers many vehicle manufacturers such as Ford; Vauxhall; VW; Peugeot; Citroen; Renault; BMW; Mercedes; Audi; Seat; Fiat; Rover. 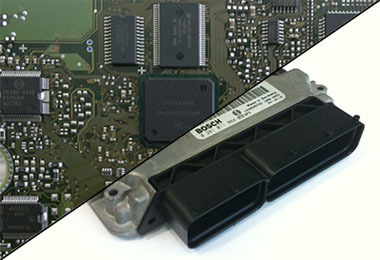 From various ECU manufacturers, such as Bosch; Siemens; Motorola; Visteon; Sagem; VDO; Magneti Marelli; Lucas; Delco; Hitachi; Denso.